(CNN) - Thirty-five educators were indicted this year in a cheating scandal that rocked the Atlanta Public Schools and drew national attention. A judge recently lifted a gag order in the case, and two Atlanta teachers accused of cheating on standardized tests shared their perspectives on the charges. "I'm struggling. I'm still struggling," elementary school teacher Angela Williamson told CNN. "To have to continue to fight to defend my name, my character, my good teaching reputation that I once had, it seems like all that has been stolen from me." 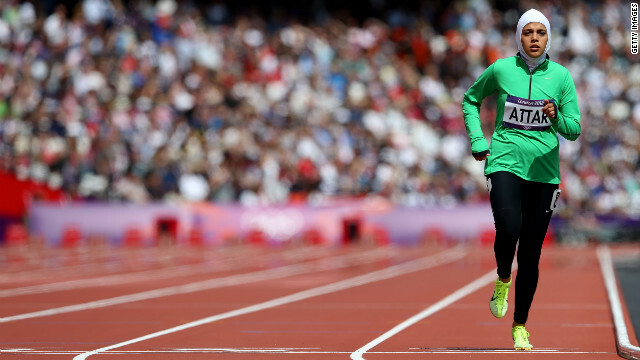 Sarah Attar was one of two Saudi women allowed to compete in the 2012 Olympic Games. (CNN) - Saudi Arabian girls will be officially allowed to practice sports in private schools for the first time, according to an education ministry announcement reported in the nation's official press agency. The new regulations for physical education, announced Saturday, require that girls "dress modestly" and have appropriate equipment and facilities, and that female Saudi teachers have priority to supervise these activities. "(This decision) stems from the teachings of our religion, which allows women to practice such activities in accordance with sharia," Education Ministry spokesman Mohammed al-Dakhini told SPA. This is the first official government sanction of women's sports in schools, but some Saudis say it is not as momentous a decision as it may seem. "This is not a big deal," said blogger Eman al-Nafjan, who writes about Saudi women's issues. "Private schools already have a physical education program, and the government knows about them. My daughter and niece both go to separate well-known private schools, and they both have sports programs." Al-Nafjan says that although the announcement will not change anything for private school students, the decision itself could be a barometer for the introduction of sports into public girls' schools that do not have physical education programs. (CNN) - The Department of Homeland Security has ordered U.S. Customs and Border Protection agents to verify, "effective immediately," that every foreign student who wants to enter the United States has a valid student visa, a U.S. government official told CNN on Friday. The memo went out earlier this week as part of an effort to reform the student visa system, said the official, who spoke on condition of anonymity. The effort is meant to provide the agency with real-time updates on all relevant information, the official said. News of the memo follows reports that two friends of Boston Marathon bombing suspect Dzhokhar Tsarnaev, who are now charged in connection with the attack, may have been in the country on student visas that were no longer valid. Dias Kadyrbayev and Azamat Tazhayakov, both 19 and from Kazakhstan, were charged this week on suspicion of obstruction of justice in connection with the case. Editor's note: Rita F. Pierson, has been an educator for more than 40 years, serving as a teacher in elementary school, junior high and special education and has been a counselor and administrator. She has led development workshops for thousands of teachers. She spoke in May in New York at a TED Talks Education event that will be the basis for a show premiering Tuesday, May 7, on PBS stations. TED is a nonprofit dedicated to "Ideas worth spreading" which it makes available through talks published on its website. (CNN) - I have been a professional educator for 40 years. I have worked at every level of the public school spectrum—elementary through high school. Having been in education for such a long time, I have witnessed many changes, all aimed at school improvement. Needless to say, not all the suggestions have been sensible. What may appear to be a good idea on paper, or when sitting around a table in discussion of it, does not always make for good reality, especially at the schoolhouse. If a child is not present at school, he or she cannot possibly learn. Schools that consistently report high student achievement consistently have students with great attendance. Yet one of our greatest school problems is student attendance. Why do we have to beg parents to get their children to school, to convince them that we need their children present and as stress free as possible? A parent asked me once why her child needed to come to school every day. She was actually upset that the school district had a policy that addressed absent and tardy children. She said it was not the school's business to tell her how to raise her children.